Create bakery-style biscuits and cake decorations in the comfort of your own kitchen! Set comprises 8 stainless steel icing nozzles and 13 stainless steel cookie cutter discs for perfectly formed biscuits and expertly designed toppings. 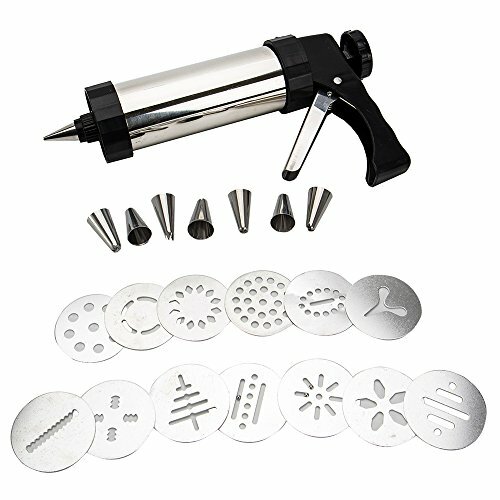 Durable, high quality stainless steel icing gun with adjustable trigger action nozzle for complete control. Easy to use - simply pop your dough in and push down the lever to create individual cookies. Nozzles and cookie cutters are dishwasher safe attachments. Wipe clean gun. Includes instruction manual and stylish presentation box. Great as a gift. Material: stainless steel + Aluminum Alloy +ABS plastic. Durable, high quality stainless steel icing gun with adjustable trigger action nozzle for complete control. Easy to use: cookie press, simply remove the top plunger rod, insert your desired disk, fill with the dough, then press the cookies out. Enjoy baking without hassle, make multiple batches of biscuits at one time which is great for holiday parties, cookie exchanges or gift giving. Package included: 1 cookie press, 13 terrific shapes of disks, 8 icing tips, recipes and elegant storage plastic box. If you have any questions about this product by Newdanceus, contact us by completing and submitting the form below. If you are looking for a specif part number, please include it with your message.